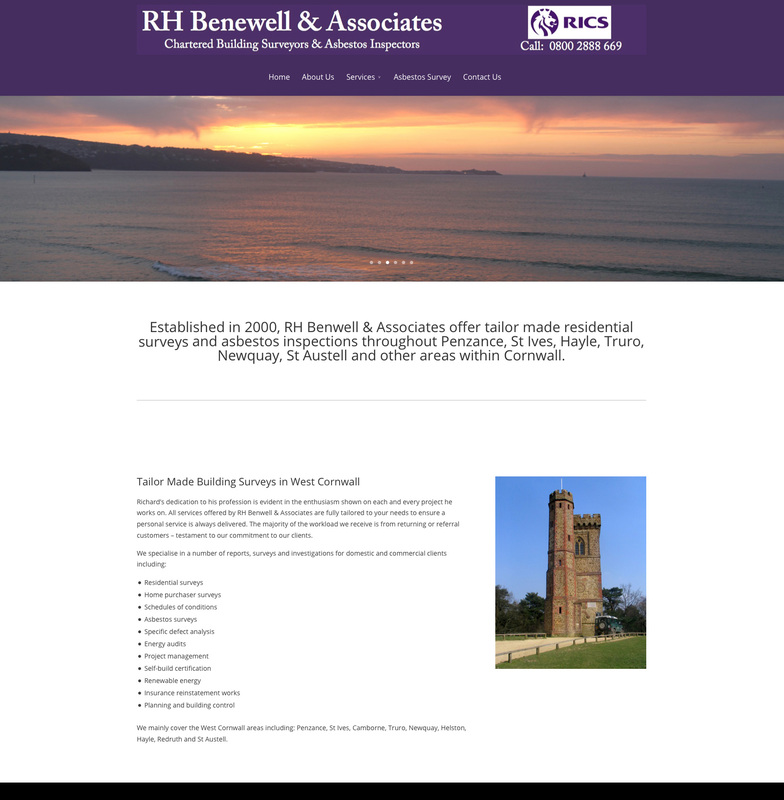 Richard Benwell & Associates needed a website redesign (buildingsurveyorcornwall.co.uk) to improve help improve their building surveyor business. Their existing website lacked visual appeal and had poor SEO (Search Engine Optimization) meaning that it didn’t appear very high up on Google and other search engines. Most clients want to have a website that appeals visually giving a professional image and one that engages with their potential clients. 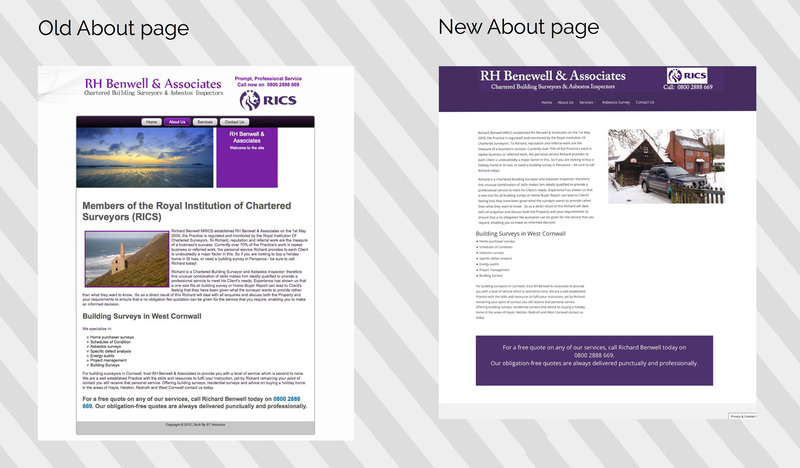 Richard Benwell & Associates existing website had some basic design issues like mismatching colours, low res images and it didn’t view well on tablets and smartphones. 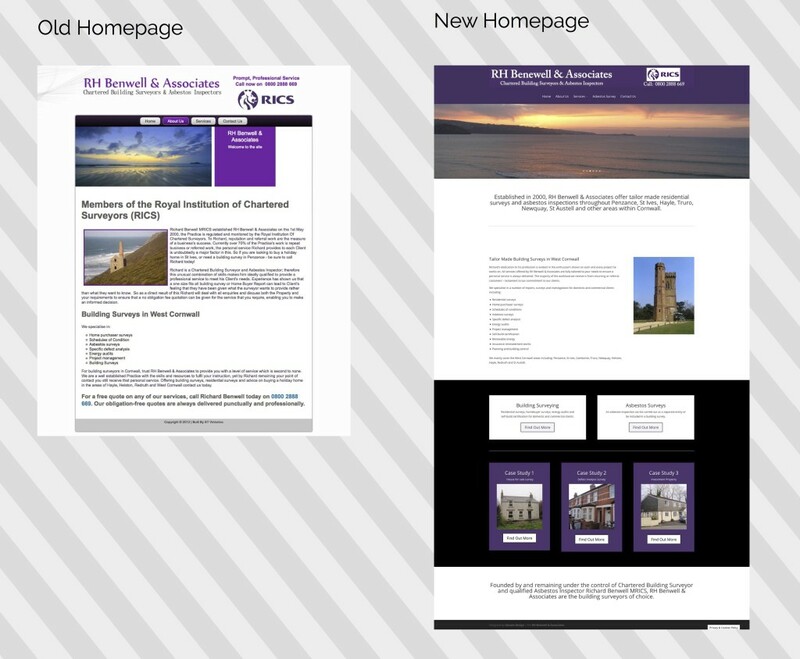 We designed the new site to be responsive so that it would adjust to different screen sizes, and gave it a clean new layout with specific colour scheme. Ranking high on Google was a major flaw of the old website and a lot of time was spent researching which search terms potential clients would type into a search engine to find a building surveyor in Cornwall. After this research we did a lot of SEO work to help the website rank well on search engines. Gaining a good organic ranking on Google for a new website can take several months so during the first few months we managed a Google Add words campaign for the new website until it achieved a solid organic ranking. The old website was ranking on page 4 of Google search engine and only a month after launching the new website it was ranking on page 1 and between position 1-4. This was a great result and we will continue to do minor SEO work and produce blog posts (fresh content that search engines like) to maintain and help push Richard Benwell & Associates website right to the top of Google (and other search engines) for there chosen key words.